Washington, We Have a Problem… A Spending Problem. Somehow the national news media, with the assistance of the lack of communication by the Republican Party, framed the entire “Fiscal Cliff” discussion about a need for increased revenue. The dialogue in the nation was completely one-sided and totally ignored that our Federal Government doesn’t have a taxing problem… it has a massive SPENDING problem. This chart alone illustrates how out of whack things are. So big deal… the new taxes that were put on those families with income above $450,000 and individuals above $400,000 barely moved the revenue trends. 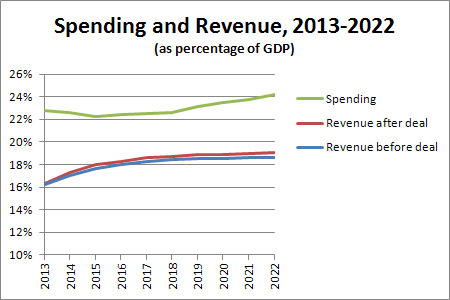 But the spending line trend continues to increase dramatically for the next 10 years. The non-partisan Congressional Budget Office estimates that the “fiscal cliff” deal passed by Congress this week will actually increase the national debt by nearly four trilion dollars by 2022. Our government in Washington, D.C., has a spending addiction and there doesn’t seem to be any path to stop it in the near future.